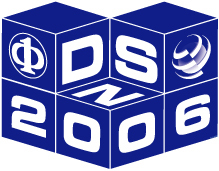 DSN-2006 will be held at the Sheraton Society Hill Hotel in Philadephia, USA. You can make your hotel reservations with the special conference discount rate at the hotel web site. Please note that the conference rate is available until June 2, June 16, 2006, subject to availability. Please be advised to book the room(s) as soon as possible since June/July is the peak travel time in Philadelphia and there is a limited number of rooms blocked for DSN in the hotel. If you have trouble booking online or need specific assistance with dates, please contact Ms. Aimee Paulino (+1 215-238-6042) directly. In addition to the technical program, conference participants and guests will also enjoy a Tuesday evening social aboard the Spirit of Philadelphia, which features a cruise along the Delaware River and the Philadelphia harbor. This map shows the assembly location for the cruise. Click here for information regarding registration for the conference. The most convenient airport is Philadelphia International Airport (PHL). Amtrak provides service along the Northeast Corridor, with regularly scheduled regional and Metroliner service from Baltimore (1 hour), New York (1 hour, 10 minutes), Washington, D.C. (1 hour, 40 minutes), and Boston (5 hours). ACELA is Amtrak's ultramodern high-speed train with service between Philadelphia, Boston, New York, and Washington, D.C. From the train station, take the you must exit the train station and take the Market-Frankford Line subway (direction towards Frankford Terminal) to 2nd Street. The Sheraton Society Hill Hotel is a 5-minute walk from the station. Go south on 2nd Street (with the flow of traffic) and turn left at Dock Street. The Sheraton Society Hill reccomends taking the Airport Shuttle Service from the Philadelphia International Airport. When arriving at the airport, proceed to the Shuttle Desk, and request being taken to the Sheraton Society Hill. The cost of the shuttle is $8.00 per person, and takes approximately 30 minutes. If you intend to take the shuttle service, it is reccomended that you call the Sheraton ahead of time so they can prepare for your arrival. From the airport, take the Regional Rail R1 train (departs from the airport every half-hour from 5:30 a.m.-11:25 p.m.) to the 30th Street Station (7th stop). Then you must exit the train station and take the Market-Frankford Line subway (direction towards Frankford Terminal) to 2nd Street. The Sheraton Society Hill Hotel is a 5-minute walk from the station. Go south on 2nd Street (with the flow of traffic) and turn left at Dock Street. The fare is $5.50 with a Daypass, which includes unlimited riding for one day on any SEPTA subway, trolley, commuter train, and bus. This map shows the Sheraton Society Hill Hotel, the nearby historical sites, and a suggested walking path to the Tuesday evening cruise with the Spirit of Philadelphia. At the Sheraton Society Hill Hotel, valet parking is available for $25.30 per day. Cultural: World-famous museums, including Philadelphia Museum of Art, Rodin Museum, The Barnes Foundation, The Franklin Institute Science Museum, The Academy of Natural Sciences, the Pennsylvania Academy of the Fine Arts. Cultural performances at The Kimmel Center for the performing arts (home of the Philadelphia Orchestra and eight resident company performing arts organizations), and The Academy of Music (home of the Pennsylvania Ballet). Gardens: More public gardens than anywhere else in North America, including Fairmount Park, the U.S.'s largest landscaped city park, and Longwood Gardens is one of the premier botanical gardens in the U.S.
Shopping: Center City (downtown) shopping includes The Gallery at Market East (the nation's largest urban shopping center), The Shops at Liberty Place, Rittenhouse Row, Antique Row, Jewelers' Row, and South Street. A short distance away are The King of Prussia Mall, the largest retail complex in the U.S., Franklin Mills discount shopping mall, Manayunk, Chestnut Hill, Peddler's Village, and New Hope. (There is no sales tax on clothing or shoes in Pennsylvania!). Subway, trolley, commuter train and bus service (SEPTA) has connections throughout the city and region. Bus fare on most routes $2.00? Tokens are available for $1.30 or a Daypass for $5.50 which includes unlimited riding for one day on any Regional Rail line, as well as the airport's R-1 line. The Phlash offers a quick and easy connection to most Center City attractions, including the Independence Visitor Center, Penn's Landing and the Philadelphia Museum of Art and is one of the best ways to visit 19 key locations in Center City. The Phlash operates seven days a week from 10 a.m.- 6 p.m., offering service every 12 minutes from March 1 through November 30, 2006. One-way ride is $1, individual all-day pass is $4 and an all-day family pass is $10. Center City is very walkable with streets laid out in a grid pattern (numbered streets run north and south and tree-named streets run east and west).